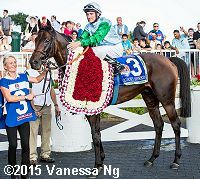 Florent Geroux celebrates aboard The Pizza Man after the 2015 Arlington Million. 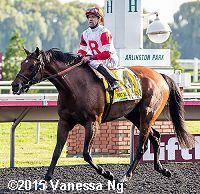 The $1 million Arlington Million Stakes (G1) celebrated its 33rd renewal on Saturday afternoon at Arlington International Racecourse near Chicago. Heavy rains midway through the card downgraded the course to yielding, but the sun broke through in time for the main event with temperatures in the mid 80's. 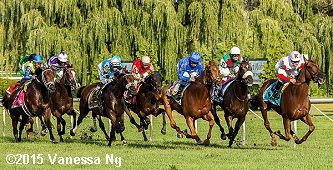 A field of 13 older horses went to post in this 1 1/4 mile turf feature looking for automatic entry in the Breeders' Cup Turf (G1) under the "Win and You're In" promotion. 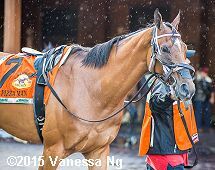 Manhattan (G1) winner Slumber was sent off as the lukewarm 3-1 choice off his second plasce finish in the United Nations (G1). 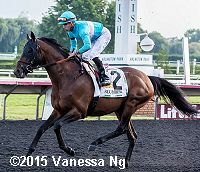 In to challenge him included 7-2 second choice Big Blue Kitten, winner of the United Nations, and 11-2 third choice Triple Threat, winner of the Monmouth Stakes (G2). Jockey Chris Emigh sent 27-1 Shining Copper to a clear lead first time by and he set blistering fractions of 21.79, 46.75, and 1:10.84 over the yielding course while as many as 4 lengths ahead of 28-1 Bookrunner and 19-1 Up With The Birds. Entering the stretch, Shining Copper continued to lead through 1 mile in 1:36.48. However, 6-1 fourth choice The Pizza Man, 9th early, came out 4 wide for room into the lane and closed with a rush, gaining the lead inside the 1/16 and holding off Big Blue Kitten by a neck to win in 2:02.20. It was another 3/4 length back to pacesetter Shining Copper third, while favorite Slumber checked in 8th. Left: The Pizza Man in the winner's circle. 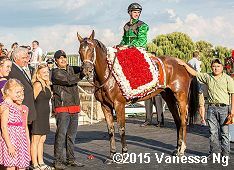 Winning jockey Florent Geroux said, "I’m always confident when I ride him, he loves to win and knows where the wire is. But I had no horse the whole way, it looked like he was struggling over the very soft track but when I put him outside he started to hold up and grabbed the bit again and I was thinking oh boy he’s going for a big one here! 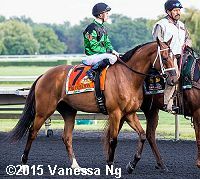 He is a local horse and even going to the track there was a lot of people cheering for us and I’d like to thank them." 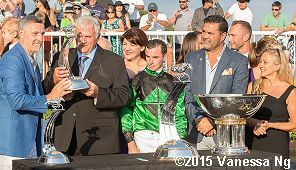 Right: The trophy presentation for the Arlington Million. 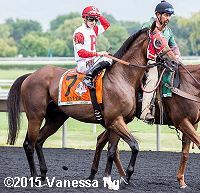 The Pizza Man is the first Illinois-bred to win the state's signature race, after winning last year's American St. Leger (G3) on the undercard. Left: The Pizza Man in the post parade. 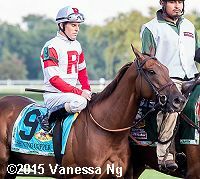 Trainer Roger Brueggemann said, "We knew he had the speed." The horse got his name due to the pizza-slice-shaped marking on his forehead. Right: The Pizza Man in the paddock before the race. Owner Richard Papiese, when asked about the Breeders' Cup Turf, said, "First I'll read the papers to see if he belongs there." Left: Second place finisher Big Blue Kitten returns after the race. Jockey Joe Bravo said, "I think I was on the best horse today but he didn’t like the ground. When ‘Kitten kicks, he’s a runner." Right: Third place finisher Shining Copper in the post parade. Jockey Chris Emigh said, "I thought I had a chance turning for home. He tried to win." Eighth place finisher and beaten favorite Slumber warms up before the race. The 3-1 favorite raced about 10 lengths off the pace under Irad Ortiz Jr., then failed to rally finishing 8th beaten 8 3/4 lengths. The Chad Brown trainee has a record of 5 wins, 5 seconds, and 4 thirds in 23 starts, earning $1,109.662 for owners Michael Dubb, Sheep Pond Partners, and Bethlehem Stables. 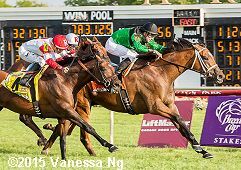 The first International race of the card was the $350,000 American St. Leger Stakes (G3) for older horses going 1 11/16 miles around three turns of the turf. Singspiel (G3) and Man O'War (G1_ third place finisher Hyper was sent off as the 2-1 favorite in the field of 9 over 3-1 Lucky Speed , fourth in the Nijinsky (G2), and 4-1 Roman Approval, second in the Stars and Stripes (G3). 52-1 longest shot Alpha Kitalpha set the pace of 48.70, 1:12.38, 1:38.15, and 2:03.85 while 2 lengths ahead of 10-1 Az Ridge. On the far turn for the last time, Az Ridge poked his head in front before tiring. 13-2 Panama Hat, fourth early, gained a 2 length lead at the 1/8 pole but Lucky Speed, 5th early, came out 4 wide to win by 3/4 length in 2:46.50 over the firm going. It was a long 4 lengths back to late-running favorite Hyper third. Left: Lucky Speed in the winner's circle. 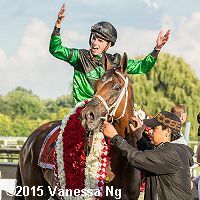 Winning jockey Andrasch Starke said, "I rode him four weeks ago in Woodbine and we knew he needed more distance and that’s what he got today in the American St. Leger, he can handle the American track very well. 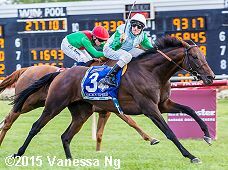 I am so happy this is my first win in the United States and to win the St. Leger is amazing. It was the right conditions to bring him over here and I’m very happy." Right: Lucky Speed gets hosed off before the race in the paddock. Of course after this race was when it rained. Left: Second place finisher Panama Hat in the post parade. 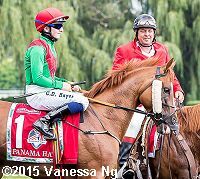 Jockey Chris Hayes said, "Had a lovely smooth trip all the way around and he kicked off the turn. I probably just met a good one on the day." Right: Third place finisher and beaten favorite Hyper in the post parade. Jockey Irad Ortiz Jr. said, "Good trip. The top two ran nice races."